Hasbro (HAS - Get Report) reported their quarterly results on Friday morning. It's not pretty. The firm generated revenue of $1.39 billion in Q4 2018. That number hits the tape about $130 million below what the industry was looking for, while showing as a decline of 13.1% year over year. How much did Hasbro miss the Toys R Us retail chain? The firm posted EPS of $1.33, profit that missed what Wall Street expected by 34 cents. Want more? Okay, buckle up. Not only did the first holiday season with no Toys R Us presence hurt, the strong dollar put the hurt on the name as well. For the quarter, HAS includes a negative foreign exchange impact of $35.1 million in their results. There must be something positive to say, so lets dig in. All three of the most significant segments performed poorly throughout the quarter. Franchise Brands printed at -8%, Partner Brands at -20%, and Hasbro Gaming at -22%. Partner Brands includes Star Wars based toys, and Disney (DIS - Get Report) did not release a Star Wars movie this past holiday season as they have in the past. There is a positive though that I do see. When Toys R Us liquidated that pushed a lot of discounted inventory out the door. Hasbro is easily the dominant name in toys, therefore it stands to reason that being undercut by their own inventory would be a bigger issue for Hasbro than it would be for Mattel (MAT - Get Report) . Mattel also saw a decrease in sales but not across the board like this. Both the Barbie and Hot Wheels segments actually improved on sales for Mattel and the firm beat expectations for this quarter. As for Hasbro, the inventory issue is thankfully a one-time thing. Toys R Us can only go out of business once. There will be another Star Wars movie. There will be more Marvel movies. Walt Disney did not go anywhere. CEO Brian Goldner points towards the next innovation cycle for Nerf, and a new Power Rangers line due in Q2 2019. I don't know if these toys turn the corner for the firm on their own, but they will help generate interest while waiting for the movie tie-ins to carry them past the goal line. The firm also announced a dividend increase. The quarterly payment will jump from $0.63 to $0.68 for shareholders of record on May 1st. Those of you who were already shareholders will receive the 63 cent payment on Friday, February 15th as long as you held the shares by Friday, February 1st. 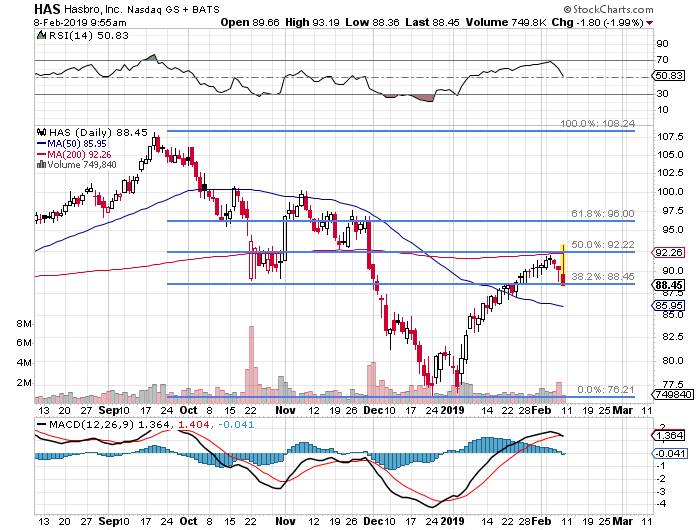 Post earnings the shares are testing the $88 Fib level from above. That's fairly tight. I don't trust the spot, and I don't think that I spend for the shares there. The 50 day SMA of $86-ish? Perhaps, but only with an entry level tranche. The firm really did not give us a catalyst other than the dividend increase, and some hope that new movies will generate toy sales. I am not going to gamble hard earned money on the a newly innovated Nerf cycle. Just saying. For the cautious, Mattel packs less risk right now. For the aggressive, Hasbro bears greater potential reward, but they really need a national retailer like Walmart (WMT - Get Report) or Target (TGT - Get Report) to feature toys to a greater degree than they already have. E-commerce just does not lend itself to pleading children pressuring their parents in the way an aisle full of toys will. An Idea: March 15th HAS $85 puts are still paying more than $2. If an investor were interested in the name, why not get paid to wait? If the investor does get tagged, at least the net basis would run at a rough $83. If not, 200 clams pays for more than a nice meal for two. At the time of publication, Stephen Guilfoyle was Long DIS equity, Short DIS puts.